1) Where are we talking from today? A. At rehearsal, in a windstorm without power in Olympia, Washington trying to type by candlelight. 2) How did you get involved in music? A. We are a team of 5 summoned by lord Zordon. Nolan's parents both had an appreciation for music and had him singing before he could properly form sentences. Introducing to him the music of the Beatles, Beach Boys, and Michael Jackson. Not much has changed, including his ability to properly form sentences or lack thereof. Cos's father was a strong influence in his musical career. Starting at age 7, he taught him how to play guitar, and encouraged him to play in the school jazz band from middle school through high school. At age 16, he got Cos a job playing bass at a local church. 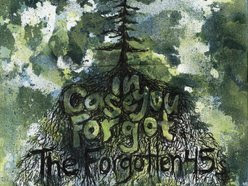 Cos met Michael during his freshman year at St. Martin's University, and that summer the band known as String Theory was formed, which has slowly transformed into The Forgotten 45's. The rest is history. Ryan grew up listening to Billy Joel, Elton John, and The Carpenters. He received his first keyboard at the age of 5 and then began taking formal lessons at the age of 7. In high school, he played clarinet and bass clarinet in his school's wind ensemble and sang in four choirs. While in college, he taught himself guitar, played in the jazz band, and, arguably most important, met Michael, Cos, and Dave. Dave grew up playing drums. Nuff said. Michael is a Classically trained violinist and vocalist and has a degree in music theory and performance. He started playing guitar because rock musicians stay up late and sleep in as opposed to classical musicians who get up early and lead boring lives. Mike and Nolan played together in high school. Dave and Coz joined the group in college and Ryan is the newest addition filling out the sound starting about 9 months ago. 3) Can you describe your music? A. We are somewhere between Weezer and Death Cab for Cutie with sprinkles of The Strokes and Brit Pop mixed in. We also draw a lot of inspiration from the Seattle Grunge movement, Alice in Chains, Sound Garden, Nirvana etc. Power Pop bands like Teenage Fanclub and Big star are huge influences as well. 4) Music wise, what are you working on? A. We will be recording our 3rd studio album within the next week. The album will consist of ten tracks we have been working on over the past year. That and we are in the market for a new bass player, this one is defective - he drinks all our beer. Yeah, we appreciate everyone supporting us from the beginning, a lot of you have been around since we first started playing together 4 years ago. 5) What would you like to say to your fans and the world? "Thank you. We love you.